The interior of Falcon Eddy’s Barbeque. Workers at Eddy’s recommended the Deviled Egg Potato Salad and Aged Jack Macaroni and Cheese. After resisting for months, I finally gave in to my temptations this Sunday. Walking home from the Davis CTA stop after every day of work this summer, my nose was always seduced by the mouth-watering scent of cured meats in the way Ancient Greek sailors were lured by sirens. And so I would remain strong and make my way to my apartment to eat my paltry rabbit food, telling myself it tasted just as good as hot Texas barbeque. But we mortals can only resist the dance of the devil for so long. On the 30th Sunday in Ordinary Time in the 2018th year of our Lord Jesus Christ, I indulged in the sweet sinfulness of Falcon Eddy’s Barbeque. 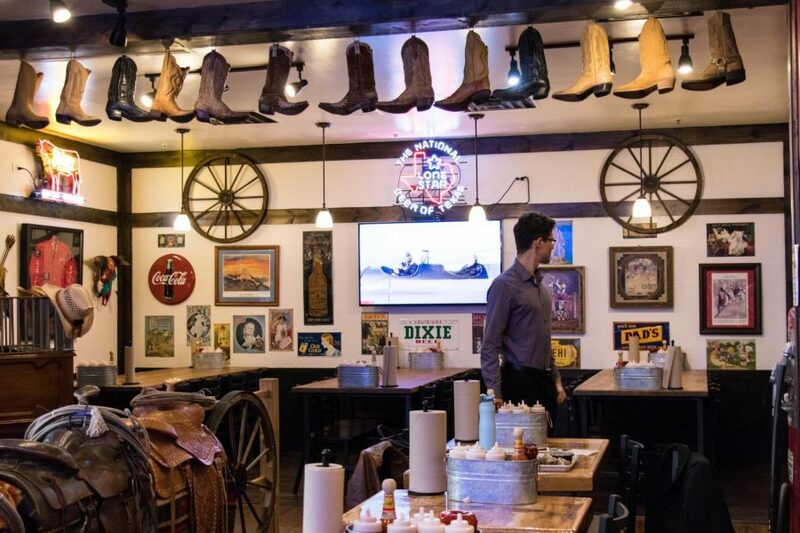 Unlike Kansas City and Memphis barbeque, which are known for meats dripping in sweet and sticky sauces, Texas barbeque focuses on the decadent flavors of the flesh. Eddy’s seasons its meats in a house dry rub, then smokes them long and slow over hickory, apple and cherry woods until the meat is practically falling off the bone. The results are tender carnivorous tastes defined by bold, smokey bodies with memories of sweetness playing underneath. A pulled pork aficionado myself, the sandwich’s buttery Hawaiian bun created a sweet and savory dynamic when paired with the dark pork. While the meat was juicy and seasoned enough to stand on its own, adding a little bit of special sauce only added dynamic range to the sandwich. My personal favorites were the South Texas Heat (characterized by a mellow spice with a vinegary tang) and the Beale Street Sweet and Spicy, which brought out the meat’s natural sweetness then finished each bite with an acidic kick. Of course, what’s any respectable barbecue without the sides? Workers at Eddy’s recommended the Deviled Egg Potato Salad and Aged Jack Macaroni and Cheese. Though not a personal fan of deviled eggs, the paprika in the potato salad did give it a nice kick. And the use of aged jack in the mac and cheese created a slightly more mature version of the classic dish; the roundness and nuttiness of jack makes it a bit like cheddar’s more artistic cousin. So, after finishing my consumption of enough meat, cheese and carbs to close up my arteries, I proceeded to skip the gym, blow off my readings and instead binge The Good Place and plow through some Halloween candy. All I can say is, live fast, die young, bad girls do it well. If you’re looking to break out of your routine meals of sad vegetables and dry brown rice, Falcon Eddy’s Barbeque will do the trick.